"One Off Broadway production you can be sure Republicans won't be flocking to is "Brian Dykstra: Cornered & Alone," but Democrats and environmentalists are going to find Mr. Dykstra 's EXHILARATING one-man show INTOXICATING and enormously satisfying." "A bitterly funny barrage of home truths about the plight of American liberals"
"LENNY BRUCE would have saluted - maybe even toked a joint with - Brian Dykstra." "Brian Dykstra : Cornered & Alone is a hearfelt, intelligent, captivating, uproarious, dignified, and, most of all important work of art. Dykstra is invading the fall 'must-see' lineup and he is not going to stop until he has reached his goal: change....I leave you with an opinion of my own; one which I have told every person i have talked to since I saw this show; GO SEE IT! See it now! Bring friends, bring family,just do not miss this one!" "Brian Dykstra recently found himself listed on a Rush Limbaugh-affiliated website as an "enemy" of the conservative talk radio host. This seemed strange to Dykstra because there was no indication that Limbaugh or any of his self-styled "Dittoheads" had attended the Brian Dykstra : Cornered and Alone . " "Equipped with a SHARP WIT, a poetic flair, and just the right amount of cynicism, he has put together an engaging and timely performance piece that won't win him any friends amongst Republicans but SHOULD BE SEEN BY EVERYONE." "Listening to Brian Dykstra is simply EXHILARATING." "Brian Dykstra is damn pissed. His one-man show is about the myriad things that he sees corroding our society. The questions he raises are TRENCHANT and on target. His description of Hollywood's manipulations juxtaposed against the show business of Washington is subtle yet POWERFUL." "The Times pushes yet another anti-Bush art show in Friday's Weekend section. Reviewer Anita Gates has kind words for Brian Dykstra 's one-man political propaganda show, "Cornered & Al one," playing on Manhattan's Upper West Side." "Dykstra nails it. A truly distinctive and groundbreaking piece of work…It is not a changing of teams, or even necessarily political activism that he wants to illicit from his viewers, but rather feelings of catharsis and community; a kind of therapy through theater that signals a melding of politics and art that is rarely seen even in today's politics-as-entertainment mindset." "Challenging, provoking and provocative…Here's the essence of Dykstra 's very impassioned, very politically engaged, very intelligent monologue: can we even find 56 statesmen in America today who'd be willing to do what Jefferson, Adams, Franklin, and company did 228 years ago? One of the sad truths about the current state of American democracy is that the people who most need to hear it-by which I mean the ones who are likeliest to disagree-probably never will: too many of us seem to have forgotten that true freedom of choice happens only when we hear what all the choices are in the first place. Oh well: Dykstra 's one-man show is nevertheless a welcoming harbor for the folks who will see it, and it's one that gives them-us-plenty to think about." "The most poignant part of this ninety minute show is when Dykstra deconstructs the definition of the word liberal, exploring its recently acquired negative connotations. According to the definition of the word, regardless of who you get it from - Webster or Oxford - your choice, Dykstra explains that all Americans are liberal because each of us is in search of 'ideals of individual, especially economic freedom, greater individual participation in government, and constitutional, political, and administrative reforms designed to secure these objectives.'" A look at some of the left-leaning shows that will be playing in NYC during the RNC. Brian Dykstra recently found himself listed on a Rush Limbaugh-affiliated website as an "enemy" of the conservative talk radio host. This seemed strange to Dykstra because there was no indication that Limbaugh or any of his self-styled "Dittoheads" had attended the Brian Dykstra : Cornered and Al one . As it turned out, a media watchdog group called TimesWatch.com had used The New York Times 's glowing review of this one-man show as evidence of the paper's bias, and Rush's cohorts used that secondhand report to mark the performer as an adversary. Despite rumors of an actors' boycott, Broadway has welcomed participants in this week's Republican National Convention with open arms - at eight GOP-approved shows in any case. Delegates packed Sunday performances of 42nd Street ,Aida ,Beauty and the Beast ,Bombay Dreams ,The Lion King ,Movin' Out ,The Phantom of the Opera and Wonderful Town . Should the conventioneers wander off- or off-off-Broadway, though, they likely will encounter a chillier, or at least more skeptical, reception. "It seems like every theater company is waving its arms, saying, 'Look, we're doing political theater,' " says Brian Dykstra , who takes on President Bush, Justice Clarence Thomas and other conservative icons in his acclaimed one-man show Cornered & Al one , now playing at the Triad Theatre. 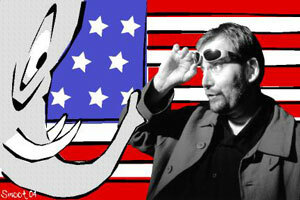 NEW YORK (DP) Liberal and proud, Brian Dykstra rants every Tuesday and Thursday at 9 PM at The Triad Theatre. Will make you think of the Declaration of Independence with a passionately renewed interest. This man should be making the talkshow rounds in order to spread his word to middle-America. Bring a politically apathetic friend. They'll thank you later (and there is a pre-election special 2 for 1 deal). "But where the short plays tackle political questions without a specific agenda, Perry's next effort, "Brian Dykstra: Cornered and Alone," which she will direct and co-produce (with Jack W. Batman and Greg Schaffert) at the Triad Theater (158 West 72nd St.) for an open run beginning Aug. 3, is 90 minutes of pure political theatre." I admit it, I've got the "I hate Bush and I'm gonna make a movie about it" blues. Months ago I lined up to see (and closed my eyes during half of) "Fahrenheit 9/11". Then came "The Control Room," a better film to my mind, though lacking in Moore's oomph. I'm glad I saw both, and ditto that they're out there truth-telling. Praise be. I haven't yet seen "The Corporation" or "Outfoxed" or any of the other clique of preaching-to-the-choir documentaries. I was this close with the first, then heard about its ungodly length (2 1/2 hours) and punked out. And Fox makes me craaazy ... so as I was saying, I've hit a wall. Must. Take. Break. Or so I thought. Al ong comes Brian Dykstra 's off-Broadway "Cornered & Al one," a one-man show mostly about the hideousness of our present government. He's a ranter, no doubt, but he's so playful and verbally skilled (watch out for the amazing, breakneck poetry), and so spot-on that I left the theater high-fiving my friends and wanting more. This guy's a serious talent -- go so you can say you knew him when. Click to download the press release.